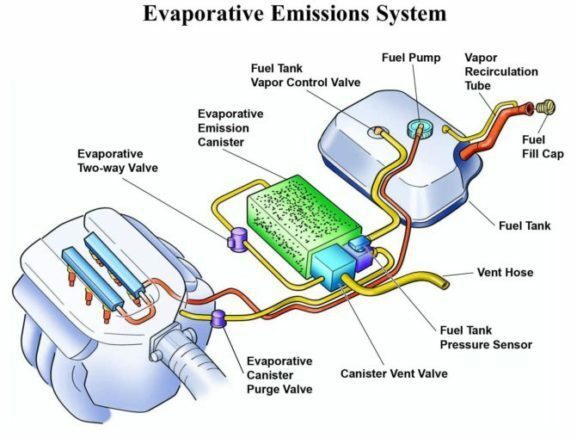 Evaporative Emission Control System (EVAP) | Car News, Reviews, & Pricing for New & Used Cars. The function of the Evaporative Emission Control System (EVAP) is to trap and store evaporative fuel emissions. The EVAP system therefore, totally eliminates fuel vapors as a source of air pollution. So, Sealing the fuel tank is not as simple as it sounds. For one thing, a fuel tank must have some type of venting so air can enter to replace the consumed fuel. The evaporative emission control (EVAP) system captures gasoline fumes and other emissions. If the fuel tank was sealed tight, the fuel pump could create enough negative pressure to collapse it. So, On older EVAP systems, the tank is vented by a spring-loaded valve inside the gas cap. While, On newer vehicles, it is vented through the EVAP canister. Consequently, A typical system consists of a small canister full of charcoal, valves, hoses, vents in the fuel lines and a sealed fuel tank cap. When fuel evaporates inside the gas tank, the excess vapors are transferred to the charcoal canister. They’re stored there until they can safely be transferred back to the engine to be burned with the normal air-fuel mixture. The most obvious symptom of an EVAP system problem is the Check Engine light. A common cause of this is a loose gas cap. Finally, If you’ve recently filled up on fuel, check that the gas cap is fully tightened. Consequently, If the Check Engine light remains on after checking the gas cap, there may be a bigger problem. 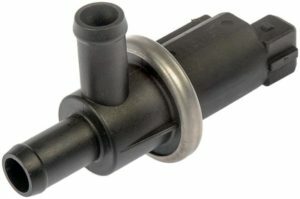 So, most common problems with the EVAP system include faults with the purge valve that vents fuel vapors to the engine. The canister purge valve, also commonly referred to as the purge valve, is an important component of your (EVAP) system. So, This system restricts the fuel vapours created in your fuel tank from escaping into the atmosphere by trapping them. When your engine runs at regular speed, the EVAP system slowly allows these vapours to be released into your engine. The flow of these vapours is controlled by your canister purge valve. The valve regulates when and how much of these vapours enter your engine. The canister purge valve is electrically operated, and is also referred to commonly as a solenoid. The most common purge valve issues are when the purge valve is stuck open or closed. Also, It may just not open at the proper time. The symptoms are listed below that may indicate your canister purge valve is not functioning properly. The first sign of trouble for your canister purge valve is the check engine light coming on. Consequently, Your canister purge valve is controlled by your car’s computer, which allows it to monitor its performance. If your car’s computer detects higher or lower than expected purging from the valve, it will illuminate the check engine light. Common error codes include P0441 and P0446, as well as other EVAP codes. Furthermore, If your canister purge valve is not opening properly, it may adversely impact your gas mileage. So, The reason for this is that the vapours that your car regularly uses will be vented to the environment. Finally, You will lose a portion of the fuel regularly used in burning. If your canister purge valve is stuck open it creates a vacuum leak that can affect your engine adversely. Simply put, air will be allowed to enter the engine in a quantity that is not predicted by your computer. This will change the car’s air to fuel ratio, and can cause rough idling, as well as difficulty starting. Therefore, If experienced together, there is a high likelihood of a failing canister valve. As a result, this enriches the fuel mixture and will likley foul the spark plugs. Also, Most charcoal canisters have a filter that should be replaced periodically. Consequently, The (EVAP) emission control system prevents the escape of fuel vapors from a vehicle’s fuel system. Fuel vapors are routed by hoses to a charcoal canister for storage. Later, when the engine is running a purge control valve opens allowing intake vacuum to siphon the fuel vapors into the engine. So, Fixing EVAP codes can be a challenge, even for professional technicians. In conclusion, If you have a P0442 small leak code, you’ll probably have to take your car to a repair shop that has a smoke machine.